There are lots of catmints to choose from. 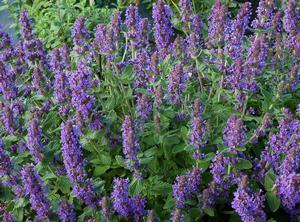 They're all great for bees, but Purple Haze has become one of our favorites in recent years. It's small and compact with particularly large flower spikes that are a magnet for bees. Are you thinking about including California natives in your garden? Visiting other people's native gardens is a great way to get ideas! Choose from over 50 gardens in Santa Clara and San Mateo counties to visit and inspire you on this free self-guided tour. Gold Rush Nursery will be holding a plant sale at Garden #73 (the Morrow-Rumbaugh Garden) in Saratoga on Saturday April 22nd 10am to 4pm. We're happy to take orders ahead of time for you to pick up in Saratoga. Visit our availability page to download our current availability of California natives and an order form. Calling everyone working in the horticultural industry. This is the best trade show in California! There's something for everyone whether you're a designer, landscape architect, contractor, maintenance gardener, arborist, retail or wholesale nursery, plant broker, student or educator. Gold Rush Nursery is exhibiting at Norcal 2017 for the first time and we hope to see you there! Find us at Booth 440. Organized superbly by the Master Gardeners of Santa Clara County, this fab event is a street fair for plant enthusiasts of all levels and interests! You'll find a multitude of nurseries with loads of plants - edible and ornamental, workshops, food trucks, good coffee ...... what more can we say?! See you there!